Please feel free to peruse the below list and join which ever club you choose to join. All clubs operate differently and independantly, however, they will all aim to bring you Cliff news and information as quickly as they can. CRFC of BIRMINGHAM - W.Midlands/Staffs./Warws./Shropshire/Hereford/Worcs. CRFC of LEICESTERSHIRE & NORTHANTS. 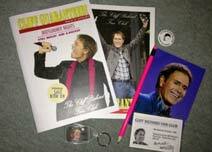 Cliff Richard fan club "Move it"